The recipe says to use dessert spoons to scoop the meringue onto the tray. I wanted them to be more unified so I piped the mixture. These were very straightforward to make and very similar to making pavlova. The key when making pavlova or meringue, is to whisk the egg whites on high speed until stiff, then slowly add in the sugar. It's important not to add the sugar in too quickly, you want each spoonful to dissolve before the next spoonful is added. You could add fruit to these, or change the way you pipe the egg whites to make them into a nest like a mini pavlova. I definitely will make these again, especially if I'm having a dinner party and want to make individual portions. Perfect meringues with a crunch on the outside and slightly chewy on the inside. Easy to make and lovely sandwiched with chocolate and cream. Preheat the oven to 140C/275F/Gas 1 and line two flat baking sheets with baking parchment. Using an electric hand whisk, whisk the whites until stiff peaks form when the whisk is removed, but the mixture should not look too dry. Add one tablespoon of the sugar to the egg whites, and continue to whisk until the mixture comes back to stiff peaks. Add the sugar one tablespoon at a time until it has all been used, and the meringue is thick and glossy. Using two dessert spoons, scoop 16 rugby-ball shaped meringues onto the baking paper, leaving plenty of space between them. Bake for an hour until the meringues are pale, golden-brown, crisp and lift away easily from the baking paper. 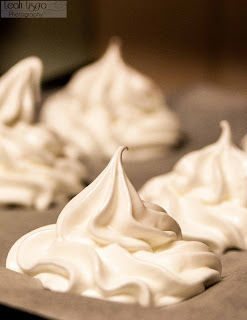 Open the oven door slightly and leave the meringues to cool in the oven. Meanwhile, make the chocolate filling (ganache). Use a large, sharp knife to chop the chocolate into small pieces. Pour the cream into a small saucepan, then bring it to just below boiling. Take the pan from the heat, add the chopped chocolate, swirl the pan to help combine the chocolate and then stir until smooth. Tip the ganache out of the pan and leave to cool, it will thicken as it cools. When the ganache has cooled, spread it over the flat side of half of the meringues, then sandwich meringues together. 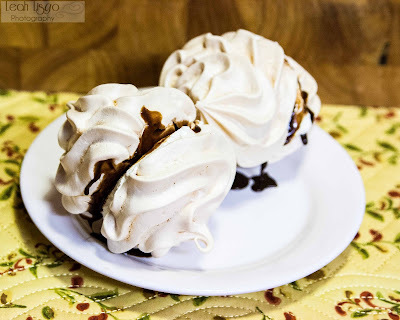 To make these a little more luxurious, whip some double cream, then spoon on top of the ganache before sandwiching the meringues together.